Jomtien Complex. This studio on the 20th floor has stunning sea views from the large balcony. At 68 sqm it offers a good living area, with ample kitchen space. 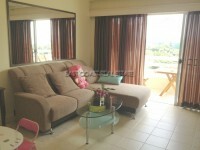 It is fully furnished including electrical appliances such as fridge and television. The studio has air-conditioning and a ceiling fan; and hot-water in the bathroom. There is a communal swimming pool, a sauna and a tennis court within the complex. Jomtien complex also has access to the beach, and is in a great location for the variety of bars and restaurants in the center of Jomtien. The complex is on a taxi route and is within easy reach of supermarkets and laundry services. The studio is being sold with the tax and transfer fees to be paid by the buyer, and the title deeds held in Thai name. Available for rent at 17,000 baht per month for 1 year contract.